TDC #20 – Kungaloosh! Hoopla! Wasn’t it just last week we were bidding a sad farewell to DisFriends? But alas, now we say goodbye to Adventurers Club. Lisa and I are especially sad that we never went! But our friend Geoff Carter of Your Souvenir Guide was kind enough to share with us about his happy times there. We also bring in a whole other kind of hoopla – Hyperspace Hoopla! 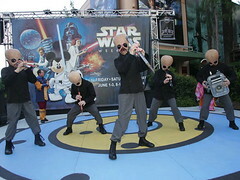 Lisa captured some live park audio last June at Star Wars Weekends, so we can do a little hyperspace hustle. Now, one particular little note: Despite Jennifer’s best attempts, she did not find any evidence of the Kungaloosh Salute on YouTube! So hey, is there anybody out there willing to record a little salute from the privacy of their own home, and send us a link to the video? And hey, as it turns out DisFriends won’t be shutting down after all: Check out this message on the site from Trent! Woo hoo! So hey, can we work a little magic here and get Adventurers Club back too? Also following up on last week’s show….our buddy Hayden dropped me a note with a little technical tip, and I created a basic Those Darn Cats page on FaceBook. I haven’t figured out how to link to it directly…but if you’re on FaceBook, just search for Those Darn Cats and you’ll find us! This entry was posted in Adventurers Club, Disney, Disney Parks, Disney Parks audio, Disney podcasts, Downtown Disney, Hyperspace Hoopla, podcast, podcasts, Star Wars, Walt Disney World, Your Souvenir Guide by Jennifer. Bookmark the permalink. did you say hooooppplaaaa??!! HOOPLA!!!!!!!! great news on the disfriends site too – now what do i do with all my karma?